These days, any mention of the term 3D is associated with entertainment. But in fact, when it comes to charting, and more specifically to charting your trading algo, 3D charting is not only insightful but provides important practical advantages. The most common chart to measure a trading algo is profit over time. That lets you know how much money the algo is making over a specific duration, usually from a few weeks to several months. 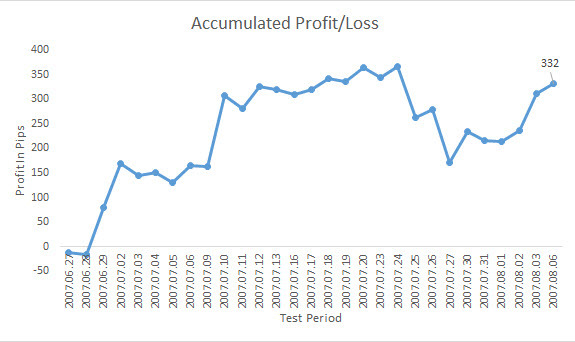 As the chart below illustrates, it gives you a good idea how well your trading algo performs over time and it gives an indication of the periods when it was underperforming. The thing is that, while profit over time are the two most important dimensions, they leave plenty of dimensions out—dimensions that can help you answer important questions. Such as why, during a specific period, was your trading algo under-performing? Or how much risk are you taking in a given time? Often, the answers to such questions can be the difference between profit and loss, between success and failure of a strategy. First things first. Before we start running 3D charts on our algo it’s important to go over a few practicalities and make the 3D chart work for you. Assuming you’ve already exported the data of your algo Profit and Loss to Excel you’re likely to have two columns of data, e.g. Time and Profit. Adding a third column will allow you to run a 3D chart, whether it’s volatility, risk or whatever additional dimension you deem necessary. Once you have your three columns you click to generate a chart—you must choose a type called 3D surface chart. As you will notice, almost always, the Time stamp will be the X-Axis, Profit the Y-Axis and our third parameter will be the Z-Axis. Now comes the important part—making the chart comfortable to work for us.You must remember that our goal in using a 3D chart in the first place was to identify areas of either exceptional profits or exceptional losses to optimize our algo. As can be seen in the charts below, Excel divides the Y axes into ranges and each range is colored. The best practice is to choose the same color for levels that are not exceptional and select a contrasting color for the highest range and another for the lowest range. This allows us to spot the exceptional. The Z axes changes the angle of the chart; the steeper the angle, the higher our Z parameter—say risk or whatever else we choose. Once you are clear as to how to make a 3D chart, it’s time to decide which dimension is relevant. Usually, besides time and profit, the following dimensions are worth considering—risk, volatility and duration. 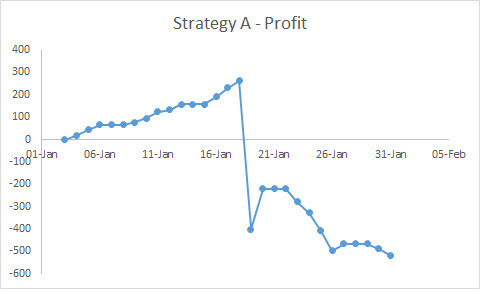 For example, the chart above shows a profit over time of a specific strategy; let’s call it Strategy A. Suddenly, out of the blue, the profit plunges rapidly. It’s not clear why, yet. Then we add another dimension—risk. Risk, in this case, will be the Dollar amount risked in a given moment. Now, the reason is apparent; just before the profit collapsed, risk was rising, as well. Maybe leverage jumped, maybe several positions were opened simultaneously; it depends on the strategy. But by using a 3D chart we were able to easily detect where trouble was coming from. 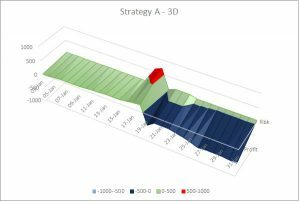 Using 3D charts is not only good to spot weaknesses in a strategy but strengths. Let’s take a look at another strategy, which we’ll call Strategy B. We will test how Strategy B performs during volatility. In this case, the volatility will be the standard deviation of each pair we trade. What we see is interesting. When volatility is high, Strategy B performs exceptionally well and not so well when volatility is average to low. In such a case, we should consider using the strategy only during high volatility to optimize returns. More uses could be to measure duration per trade. If the duration is getting longer at certain areas perhaps the trigger for the entry or exit is not working well. The benefit with using a 3D chart here is that we put the opening time stamp on the X-Axis and the closing time stamp on the Z-Axis so we can actually analyze duration per trade over time. A 3D chart then is much more accurate than a two dimensional chart where duration is a trailing average. 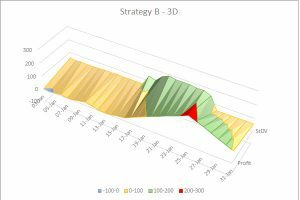 There are endless samples and ways in which 3D charts can allow you improve your trading algo and identify both weaknesses and strengths within your strategy. Sure, you can manage with a 2-dimensional chart. But the benefit of 3D charting is that, many times, it allows you to zoom in and identify areas of change much easier. The world of traders is divided into two groups; those who trade using algorithms and those who don’t. Those who trade using algorithms, aka algotraders, are well aware of the advantages of trading with an algo… And for those who don’t use algos? They are equally aware of the algo advantages but are reluctant to dive into its complexity; they are deterred from learning how. But the road to success in trading is not by avoiding challenges, but overcoming them, perhaps in baby steps. Let me ask you a question. What do you think is the first thing you’d need to do to become an algotrader? You might respond, “Learn programming, of course! How else?” Well, you’d be wrong. If you plan to learn programming for the sole purpose of becoming an algotrader, you’re likely to get lost. Eventually, in despair or frustration, you’ll give up on algotrading. There are numerous languages, from MQL to R to Python, and you have to decide which one to start with. You might find yourself wasting valuable time learning far too many trivial functions. It may take quite a long time before you even create a trading algo, let alone a profitable one. But there’s another way, which I call reverse engineering. The first step is to figure out which trading algo you want to make. In other words, what are the functions and strategy it should implement? Then you test it and finally, move on to the programming part. This way, you’re focused like a spotlight. You know exactly what your algo should do and can focus on the exact functionalities you need to learn to make it happen. Everything will just come intuitively; which language, how and in what. All the pieces will fall much quicker into place because you already know what to look for. The best way to start is by using a flowchart. It is actually one of the first things you learn in programming schools. And what determines the flow? Of course, it’s the conditions. What we call the “ifs.” “Ifs” can be one condition or have many “ands” and “ors.” That’s how you decide what your algo should do in any given circumstances. The conditions to the algo are what the brain is to the body; they do the thinking. Once you’ve made a flowchart of conditions, rather than using a complex tool, use Microsoft Excel or some other spreadsheet software. Extract historical data of a price data; start by using only the closing price. If you want to trade on a daily interval, extract daily data and so on. Use a separate column for each of the conditions in the flowchart, that way it’s easy to write and figure out. Add another column for a buy and sell output to mark when you “opened” and when you “closed” a position. And finally add one column of accumulated profit/ loss. Use separate columns for each conditions and fill the chart. All you need now is to run a linear chart on one column, accumulated profit/loss, and look at the algo’s historical performance. Once you master the basics you can move on to move advanced back-testing and curve fitting. But for a start that will do. Ok, you’re not a “baby” anymore; you have a good idea of what an algo trader needs to do. Now that you’ve got the concept down pat, you’re ready to begin learning programming. In terms of which language to start with, that will depend on the circumstances. If you are already using an MT4 platform, it’s a no brainer; learn MQL which runs on MT4. The MQL website is filled with “how to” materials. And since you already have a diagram of your algo and an idea what you want to do, finding your way should be simple. But if you trade with a different broker, you’ll have to decide which best suits. Personally, I recommend starting with MQL, just because it’s easier. Then, you can move into Python, which is a rather easy language to learn or C++ if your algo needs to work fast. If you algo is heavy on the math then perhaps R would fit. Or, of course, you can learn from a book. I am more of a book person, but that’s just me. Then there is another issue—API. API is the mechanism that enables your algo to communicate with your broker and execute your trades. Some brokers work better with certain programming languages than others. Most large brokers have communities and forums that can go into detail as to the best way to use an API. Unlike the first two baby steps, no one would ever say that learning to program was a baby step. Rather, it’s more of a giant leap. It takes time to learn and to master, though it is worth it in the long run. Meanwhile, you can always use libraries of codes on the web for more complex algos. The thing is that once you’ve accomplished the first two baby steps, making the final leap into programming is a no brainer. Forex swing trading is a mechanical trading method that harvests gains from forex pairs over periods of one to several days. Some forex swing trading strategies produce ho-hum results in trendless markets. Yet, I’ve found that a strategy based on 34-day exponential moving averages works well, even during range-bound sideways markets. With the forex swing trading strategy described below, I use my mechanical trading system to take advantage of short term price trends and patterns that I might otherwise miss out on. First, let me define the term “forex swing trading.” It means trading based on short-term price ‘swings.’ The price of the forex pair moves back and forth between “swing points,” which are the inflection points within an overall price range or channel. 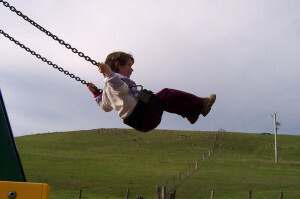 The direction of the swing trade can be either long or short. Forex swing trading positions are usually held for a longer period than a day-trade, but for less time than buy-and-hold strategies which involve holding positions for weeks or months. Forex swing trading offers an ideal mechanical trading strategy for independent traders like me, since my algo trading system can quickly recognize and exploit short-term price movements more effectively than large institutional traders can. Although some traders apply swing trading to stocks, in my experience forex swing trading is the perfect form of swing trading. And, forex swing trading is better than day trading or long-term trend trading. Here’s my reasoning: Although day trading can be good for risk management since the trader doesn’t hold positions overnight, it also limits the profit potential, since large price moves can occur overnight. Trend trading may capture the profits of longer-term price moves, yet it also puts the trader in a position of facing worrisome drawdowns while awaiting the anticipated continuation of a trend. Forex swing trading offers the best of both worlds: It has the advantages of trend trading and day trading, but without the drawbacks of either method. The twenty-four-hourly nature of currency markets is ideal for swing trading. With my mechanical trading system, I enjoy a great compromise between the two extremes of day trading and trend trading. I find short-term trends in the forex markets, ride them to profitability, then I exit my position right when the price move ends. 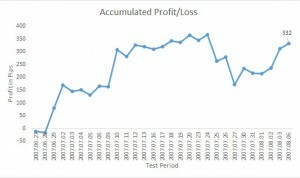 My mechanical trading system harvests small but consistent gains which add up over time. Even in an apparently-trendless market, I can still be successful. My trades are based on automatic data analysis in real time, and my trading algos provide super-fast trade executions. Best of all, my trading decisions are based on objective parameters instead of relying on my emotions about a particular market. Knowing the best entry and exit points is the key to successful forex swing trading. Through the magic of a mechanical trading system which uses the best indicators and effective algorithms, I don’t need to have perfect timing. Forex swing trading can be based on a simple set of rules, or you can program your mechanical trading system to use a somewhat more sophisticated set of rules, as I do. In forex swing trading, my mechanical trading system uses a set of mathematical rules and indicators for buying and selling forex pairs. By relying on my mechanical trading system rather than manual trading, I enjoy several benefits. Among the simplest approaches are those which measure the price of a forex pair by using 3 different moving averages based on closing prices. The mechanical trading system is programmed to trade the forex pair “long” when those 3 moving averages become aligned in an upward direction. Likewise, the forex pair is traded “short” when the 3 moving averages are heading downward. I use a forex swing trading strategy that lets me take advantage of fairly short-term price moves, so I can profit even in an overall trendless market. I have a reliable and dependable short-term trendline-breakout strategy, and it can harvest quite a few pips from the typical winning trade. The EMA is similar to the ordinary MA, except that it gives more weight to the most-recent data. I do this because the EMA reacts more quickly to the latest price changes than the simple MA does. This type of moving average lets me win in markets which would appear trendless over longer periods of time. Some traders use either a 12-day or 26-day EMA, especially to create indicators such as the popular moving average convergence divergence (MACD) indicator, or a percentage price oscillator (PPO). And, in comparison, the 50-day and 200-day EMAs are often used to signal changes in long-term price trends. Instead, for my forex swing trading I use the 34-day EMA (also called a 34ema) because I’ve found it offers the best way to determine short-to-mid-term trend direction in forex markets. Of course, you can experiment by back-testing different time periods in your own chosen markets. Try 7-, 14-, 25-, or 50-day EMAs to see if they work better for your particular forex pair. Still, after my own lengthy research, for me a 34ema works best. Using my mechanical trading system, I enter the forex swing trade just after a break in the trendline. Based on the 34-day EMA, my mechanical trading system watches for a price rally or pullback. Then, as soon as that rally or pullback falters, my mechanical trading system executes the trade. 7. If my buy-stop order isn’t triggered, and if the candlesticks continue to set lower highs, my system moves the buy-stop order price to the successively-lower high on each candlestick that forms; eventually, the price will move upward and trigger my order. For purposes of risk management during forex swing trading, my mechanical trading system automatically places a stop-loss order just a few pips below the low of that candle which triggered my order. I ride the short-term swing, then harvest the gains and manage the risks as described later in this article. 5. Alternatively, my forex swing trading program can set a buy-stop order just a couple of pips below the low of the signal candle, so if the price breaches that low, my order is executed. And, since good risk management is essential for survival in forex swing trading, my mechanical trading system sets a stop-loss order just over the high of the candlestick which triggered my entry order. Forex swing trading works best for me when I’m not greedy. Some traders, especially those whose trading strategies are only profitable during large moves, try to squeeze too much out of every trade. By doing so, they often risk losing all the gains from that trade. I have a different philosophy. Since markets are often trendless or trading sideways for long periods of time, I have plenty of trading opportunities. I’m not in a hurry to make a “killing” on each trade. I’d rather gain a small amount from many trades, since there is less risk for me that way. When the trade goes in my direction and I’m in the profit zone, I lock in my profits by programming my mechanical trading system to use trailing stops that move along slightly behind the current price. I use my mechanical trading system to set the trailing stops just a few pips below or above each of the successive dips and rises during forex swing trading. My forex algorithms choose the trailing stops based on the very-short-term support and resistance levels. By setting trailing stops this way, I usually avoid being stopped out prematurely. If the short-term trend continues, I can often ride it for several days. And, I always have plenty of trading opportunities, so I’m not feeling pressured to remain in a marginal trade which turn against me. I use short-term trendlines and price action to great advantage. When a price breaks through its trendline, it’s usually a sign that the trend is changing. My mechanical trading system helps me enter a new trade at the beginning of the new trend. My 34-day EMA forex swing trading strategy gives me plenty of advantages as long as I manage risks appropriately. This strategy lets me trade with the short-term trend while avoiding the major drawdowns that some traders experience by attempting to follow long-term trends. My 34-day forex swing trading strategy offers a critical advantage over most forex swing trading strategies. Since moving averages are essentially lagging indicators, choosing the right time frame is the key to success. Many forex strategies are based on simple moving averages or longer-term moving averages. So, they usually perform poorly in trendless markets. Yet, my 34-day EMA strategy uses a time period that’s more effective than longer MA periods. In order to enjoy the advantages of my system, I must manage the risks appropriately. Overall, the risks of forex swing trading are comparable with any other type of speculative trading. In markets which are completely trendless over the shortest time periods, it’s important for me to ensure that my stop losses are fairly tight. On the other hand, during bull or bear markets forex swing trading can be even more profitable. Sometimes, the market will make a sudden sharp move in such a short period of time that the “swing points” won’t be detected by my mechanical trading system. Gap-up or gap-down breakouts can happen so quickly that my mechanical trading system isn’t able to respond effectively. Still, by using the 34-day EMA, I’m usually able to participate in most market moves, while avoiding false signals in an overall trendless or sideways market. For me, using a 34-day EMA indicator is the best foundation for my forex swing trading. I’ve used it to develop and fine-tuned a winning strategy for my mechanical trading system. It offers me the “best of both worlds” and it even works in markets which may appear trendless to longer or shorter time periods of moving averages. And, I’m not the only trader using a 34-day EMA strategy in the forex markets. During the past couple of years there’s been some research about forex swing trading using 34ema as an indicator, as well as plenty of articles and trader chatter about this type of strategy. If you’re a serious forex trader, and you’re a bit frustrated by markets which seem trendless, I suggest that you try a 34ema strategy for your forex swing trading. The Limit Order Book is lurking behind every price tick in every market you can imagine. From the ill-liquid real estate market, all the way to high frequency bond trading, the limit order book determines all price movements. A simple example in my last post of supply and demand demonstrated how price changes in an equity market. I made several arguments justifying the existence of a bid ask spread, and showed how this leads to price formation. My goal in this post is to find clarity in the foggy world of support and resistance using limit order books. Support and resistance information can be used to build confidence when entering or exiting a trade. 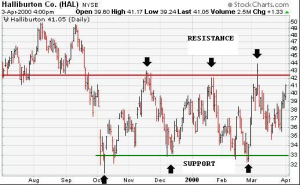 If you try searching for support and resistance, a wealth of information can be found usually in the form of some article accompanied by several charts with lines claiming to have found the magical levels. Every such chart I have found, however, has one single thing in common. The stock price always, at some point, just slightly crosses these horizontal lines. To me, it feels like a slap in the face… the ultimate I told you so from market experts that can apparently see into the future. Here’s a great example I picked up on Google. 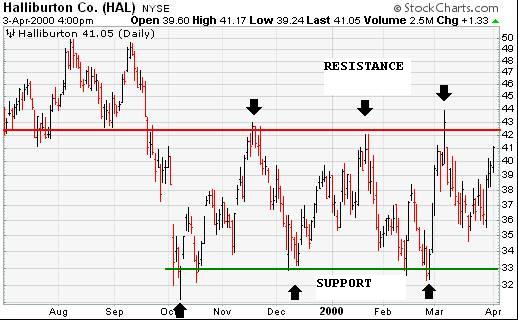 Figure 1: Support and Resistance levels breached leaving question of imaginary lines. I realize that mathematical definitions of these levels exist, and I realize that human psychological traits are often correctly considered. Nevertheless, they still lack precision! The arguments for true black and white support and resistance levels always must always have a fair amount of uncertainty. Sadly, this is just another part of working in this business. If I see a price move past a resistance level in real time (i.e., not being able to see the entire future nicely displayed in front of me like Figure 1), I often question if the level has been breached. This could perhaps leave you in the worst possible position as the market rockets the wrong way. The limit order book can reduce this uncertainty by displaying real information. Suppose a stock is testing a human psychological resistance level of $20.00 and your algorithm has signaled that you initiate a short position. You wish to enter the market at the highest possible price without missing the peak. More importantly though, you wish to confirm a resistance level still exists . If the current order book is displayed as below left, you would have confidence that enough sell pressure is present to hold the resistance. Figure 2: The left side of the image shows more market depth on the offer (orange), which is resistance. The right image shows light depth, which is the absence of resistance. On the other hand, if the order book is displayed as above right, it it would take only a moderate collection of market order buyers to break the $20.00 level– and break it fast in this example. Short sellers would run to cover, and the market could swiftly move against you. I found some research out of Wharton suggesting an order book metric (cumulative depth), and have heard more advanced ideas shared in my personal research symposiums. That said, I think this situation is being made too complex. Translating the above example into math should be straight forward, and customizable to the strength of signal generated by your algorithm. Allow me to suggest a crude, yet effective starting place. Suppose you are back watching an equity as it approaches what you think to be a $20.00 resistance level. You need a metric to identify the strength of the resistance, and have one of the given order books displayed above in Figure 2. In the order book on the right, you could find the average price it would take a market buyer to pass four levels of depth. This calculation ((2*19.99+8*20+1*20.01+2*20.22)/12) shows resistance strength of 20.0008. Using an analogous calculation on the left shows resistance strength of 20.0063, a greater value that can act as a metric defining a resistance level. The more expensive it is to surpass a level of resistance, the less likely it will happen. Exactly how this metric is created has many degrees of freedom. If you suspect a resistance level exists at $20.00, you could initiate a position that depends on how expensive a set of market orders would have to be to consume past the resistance. You could also alter how far deep to look when calculating the average price. These two measures involve simple math, and provide a deeper insight to market movements. They are based on the absolute lowest levels of price formation by supply and demand, and are certainly items to consider when building a full system. In my next post, I will provide a more specific strategy to consider implementing. The second part in Nathan’s interview series with me focuses on the role of high frequency trading in the markets and testing trading strategies. If you missed the first automated trading interview in the series, you can read it here. Do you have any specific thoughts or opinions on HFT (High Frequency Trading)? This is such a hot topic among traders and I would imagine you have a unique insight into algo trading in general. Do you see machines eventually replacing the “human” trader or could HFT eventually get banned from the markets? At least for day traders it seems to give quite an unfair advantage to the HFT camp for executions? There is a huge difference between algorithmic trading and HFT. HFT is obviously automated due to the speeds involved, but that does not imply that all automated trading is HFT. It’s only a subgroup. Sure, there are plenty of automated systems that are not HFT. I bring it up under the context that HFT uses deceptive algorithms for their order posting tactics. HFT is uniformly destructive to capital markets and their purpose. It nickels and dimes investors and traders through market manipulation. Just last week Nanex detected a single organization that pushed through 4% of all the order flow on US equities quotes. Even worse, not a single one of the orders executed. Posting orders without the intent to trade is blatantly illegal. The other negative consequence of HFT comes from the rebates that the dark pools and exchanges pay to “liquidity providers,” which are really the HFT bots. The arrangement tangibly alters the motivation for participating in markets. Rather than investing or even speculating on price, the HFT algos generally do not care about market movements. They just want the liquidity rebate. This to me is the bigger issue. The whole arrangement is shady and as you said it alters the motivation for market participation. What steps or changes do you recommend? The Market Ticker blog is one of my favorites on that subject. 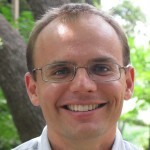 Karl Denninger advocates a regulatory rule of a two second minimum order time. I support the idea. Nobody can plausibly claim that an order placed for such a short duration is for any trading purpose. If an order is not intended to be filled, it should be not permitted. I cannot argue with that logic. Back to testing, how important is accounting for commissions and slippage to the integrity of any back-testing data in your opinion? To me, as you go down the scale from longer term trading to day-trading the importance grows exponentially. I fully agree. The consequences of trading costs pile up with increased frequency. Shorter time frames multiply the frequency, which as you pointed out, grows exponentially. My personal preference is to skip trading costs and commissions on short time frames so that I can obtain a sufficient sample size for my analysis. I do not foresee myself ever trading on one minute charts, but I almost always use one minute tests to analyze randomness within a strategy. Unlike most systems developers, the profitability of a system is a backseat concern. I read a newsletter this morning written by a multi-million dollar businessman. He concluded today’s article saying that if you start a business to make a lot of money, you’ll more than likely fail. You have to excel at providing a quality product and service in order to succeed over the long run. When the inherent business excels, only then does the long term money follow. Trading is a business in precisely the same sense. Most traders rush through the system development process to spit out quick profits. They rarely, if ever, consider a strategy’s performance over a lengthy period of time. Everything is about the here and now. Additionally, good systems frequently lose money. You need something more in the toolkit besides the random scorecard of profit and loss. Good systems do have losing periods, yet many traders seem to be convinced there is a “holy grail” approach out there that will buck this fact. If some of the most successful traders ever have posted losing periods (or even years) and have been around for 20+ years it seems hard to fathom beating their performance from day 1. Regarding testing platforms, you were one of the first people that really explored the issues with back-testing Forex – can you provide more detail on the problems for those that are interested in developing and back-testing a system for FX (MetaTrader platform)? You’re opening a can of worms on this one. MetaTrader is hands down the worst platform available for backtesting. The data is notoriously unreliable. Even when good data is at hand, the instructions for importing it and turning it into something usable fill a dozen pages of instructions. You’re much better off doing real analysis in NinjaTrader, TradeStation or MultiCharts. The metrics are vastly superior and require a tiny fraction of the effort. I still think that MetaTrader is sufficient for live trading most strategies. I am a huge fan of live testing/trading alternate strategies. One of my biggest “A Ha” moments came during live testing alternate exit strategies. I traded my account with my original exit approach but also demo traded alternate exit strategies in real time. There is value gained that you don’t always get from a back-testing print out. How do you compensate for slippage when testing a strategy? Forex is thankfully unique in that it doesn’t come with unique problems other than rollover. The markets are the most liquid in the world. As a retail forex trader looking at charts longer than five minutes, you can generally assume that the historical prices are reasonably reflective of executable prices for the strategy. I compensate for slippage and bad ticks by doubling my expected transaction costs. For example, I pay 1.5 pip spread on the EURUSD. When I test a strategy, I demand that it must hold up on 3 pips transaction cost on every trade. Before we wrap this up, are there any specific strategies or common parameters that you have noticed in systems that make it? We both know how small of a percentage of traders become successful, but as it relates to mechanical systems are there recurring themes for those that are profitable? No, there are no recurring themes that I see. The lowest common denominator is that they do not overtrade and that they use low leverage. Other than those two items, each successful strategy differs substantially from all the others. The most important ingredient in system development is the developer. I have yet to program a successful trading system for someone without years of full time trading experience under their belt. You have to go through the school of hard knocks if you’re going to make it. Almost all of us are too stubborn to listen to good advice. Shaun, I can’t thank you enough for providing such honest responses and sharing your insight. If you are interested in learning more or considering coding your system, go to MetaTrader Programming for more information.